Hi I am confused while creating back-up and restore point in my windows 7 please tell me does this feature will create backup of my stored data in my hard disk if no then what windows backup and restore point do. Re: Can windows back up and restore feature will keep the back up of my hard drive and restore all stored data? Creating back up will protect your data from any kind of damage or loss as you may have back ups. Windows 7 allows you yto back uo data and restore your system to an earlier junction where in the system setting will be restored to the date or point where you restore it to. However there is no point backing uo data on hard drive.right??? you need to back up and keep data in flash drive, external hard disk and further in online system of windows live sky drive. If you have further queries regarding how you can do the same you may consult the following link.if however you still find problems let me know. Friend, Windows Backup and Restore Feature will save your data. It save from loosing the information which is present on the Hard Disk. Back up is used to maintain data from Viruses or Intruders. Restore is used to bring back your Computer and it's data to the Point at which Restore Point has been Created. Whenever you face the problem of System Crash you may loose your data. If you Restore your Computer, then using the Restore Point you can bring back your Computer to the form which it was at the time of Restore Point. View this Video to know how to Restore your Computer. dear windows 7 provides features like system restore using which you can restore your system to earlier time when it was working properly. for this you can choose system restore from the system tool option and then you can choose the date and time at which you want to restore your system. this restoration takes place as windows automatically save all you data as a back up so that using restore tool you can get your data back and also so that your data could be saved protectively. Don't be confused. There is help option if you need any assistance. However, Back up and Restore feature will backup your all data, so that in future you will not feel any problem to restore that data. You can change in settings that which items are to be backup in dialog box of Backup and Restore. Backup and recovery are 2 different things. By creating a back up file you can actually save your important data . So when you format or in case of your data loss you can get it back. A recovery disk on the other hand helps in recovering your OS. Don't be confused,because the recovery and back up are not the same things. if you make a copy or image of your files in a separate memory then it is called backup. If you lose these data anyhow,you can restore these from the backup location. But restoration is totally a different thing. It is a different kind of back up where you can save your OS copy. So both windows Backup and Restore feature saves your data from unwanted loosing. Check the video to know more about this. Windows backup and restore maintains and helps you to have an back up of your important files and folders specified by the user when he sets the back up of those file . So , when your those important files are damaged or deleted than the Back Up and restore function of windows takes charge . It will help you to get those files or folders from the disk or destination that you have specified when creating a back up of those . So , your doubt must have been cleared now . Yes you take a backup and restore the data of your Hard Drive..
To set up a backup in Windows 7 in you Hard Drive. Right-click on your local drive and select Properties. 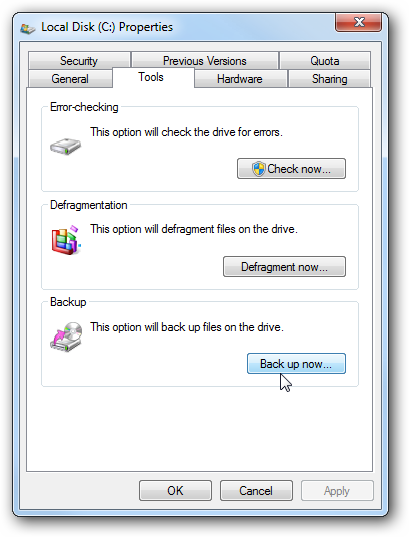 In the “Back up or restore your files” window click the link to set up a backup. Search the Drive to store the backup or choose a location on you store the backup. Select the files and folder to take the backup. And next window take a review the backup job and make sure everything looks correct. Save the backup settings and click the View Details button to see the backup processing. Double click on the backup file and can restore files or manage the size the backup folder. To Restore a file from a backup, click on Restore my files in the Backup and Restore Center. Now you search the recent backup file or folder and click the Brows the folder and restore them back to the original location or choose a different location then click Restore. Click on the Manage Space link then click on the View backups button to check the different dated. Open the “select how windows retains older system images” window and select the one radio button out of two then press the Ok button..
we have two types of backups. Random Backup means Windows Backup manger is Randomly enable Some important locations files and Folders . we can select our wanted Files and Folder for take backup. if you store on secondary storage Device. You may be insert multiple cd/ Pen drives In the process. 3. Click on Back up and Maintenance . 4. Specify the Backup Devise . 5. Specify for Backup Type . 6. Click on Backup Now Button. Now haply take your backup.